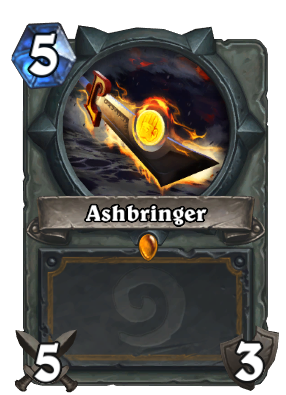 Divine Shield, Taunt Deathrattle: Equip a 5/3 Ashbringer. GOLDEN TIRION FORDRING ENTRANCE ANIMATION! Just unpacked this guy golden. What a beautiful card. You know, about 9 months later, Paladin is the fastest class in the meta. This is one of the cards that remains OP forever. since owl nerf and entomb rotating out of standard, this card is insane. 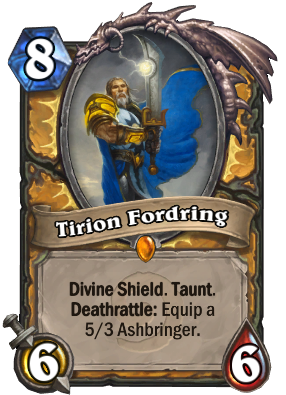 This probably shouldn't have divine shield given the insane Ashbringer value and that he's a taunt. It would make him a bit more fair against decks trying to rely on big creatures while changing nothing for the transform spells that some classes can counter him with. I've gone crazy, but, I've just crafted it in gold. Hope to never regret it. I put my faith in this card and it delivers!